It was one of those weekends where I didn't feel like baking. Not one little bit. A lazy Sunday morning (after catching up on the sleep that I lost during the week) needed French toast. It had to be done. 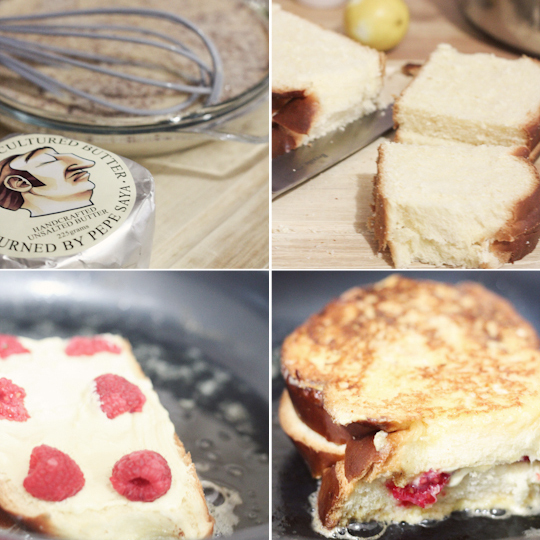 I had a loaf of day-old brioche, a bar of white chocolate and a punnet of raspberries. Raspberries are totally out of season in Australia at the moment and stupidly expensive, but you know when you see something in the store that you just can't resist? 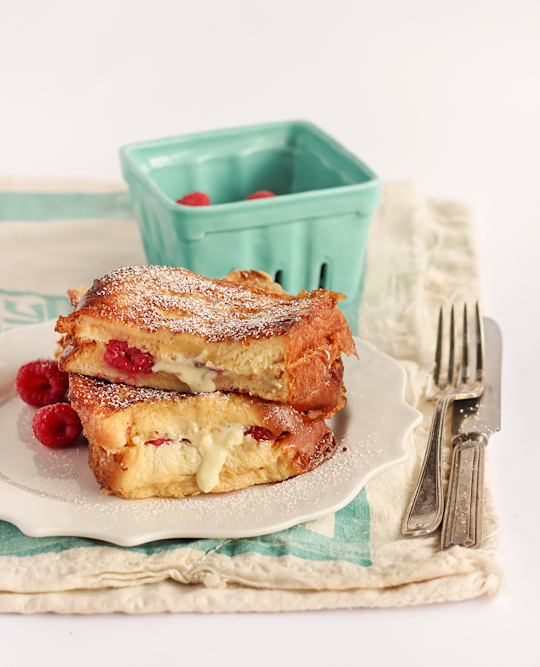 I'm so glad I didn't fight the urge in this case because it led to this White Chocolate & Raspberry Brioche French Toast. So ridiculously good. I didn't realise until I started looking at the photos just then how they look a bit like grilled cheese sandwiches, which I admit is a little gross. It's a pity because this was such an indulgent, delicious dish that I wouldn't want anyone to be put off by mistaken appearances. The similarity couldn't really be helped since I used white chocolate, you could probably use milk or dark chocolate and it would taste great. But I think white chocolate works the best with all the other flavours going on here. The French toast mixture that I used was perfect, just like Martha promised. It's lightly fragrant with spices and fruit flavours, and when you bite into that thin, crisp outer layer (that I fried in some damn good cultured butter), you will want to do a little dance. The hit of cinnamon, the sweetness from the melted white chocolate and the burst of tangy raspberries, what a combination. I'd definitely recommend going to the trouble of getting your hands on some brioche if you want to make this, store bought or homemade. Though regular white bread will work it doesn't have the same lightness of texture and beautiful richness that brioche bread has. This particular version doesn't even need any maple syrup on top, there's enough sweetness from the white chocolate. And make sure not to soak the bread for too long or it will still be soggy in the middle even after you fry it up. 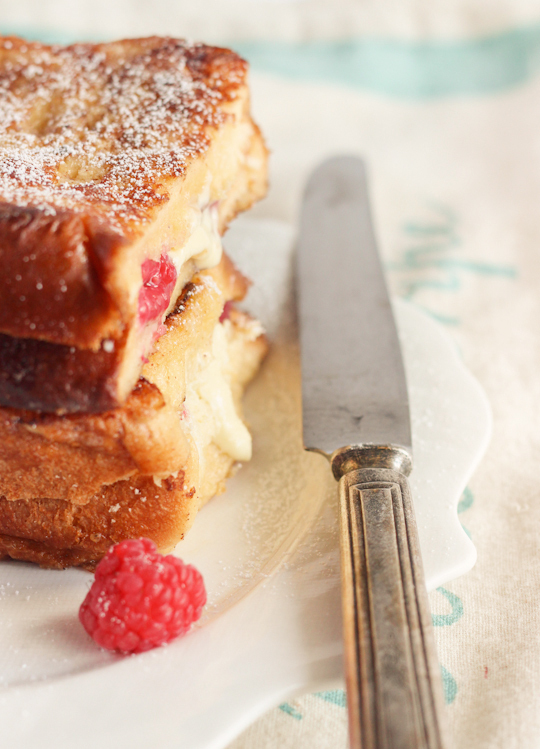 Have it for a very indulgent breakfast for a special occasion, or have it as dessert. Either way you won't be sorry. (If making a bigger batch, preheat oven to about 95°C (200°F) and keep toast warm in oven on a wire rack while making the rest of the batch) Whisk together eggs, milk, juice, vanilla, sugar, zest, cinnamon, nutmeg, and salt in a shallow baking dish. Place skillet or non-stick frying pan over medium heat and melt about 1 tbsp (15g) of butter in the pan. Dip one slice of bread in mixture and allow to soak for 20 seconds. Place slice dipped side down in the pan and fry for 2-3 minutes until golden brown. 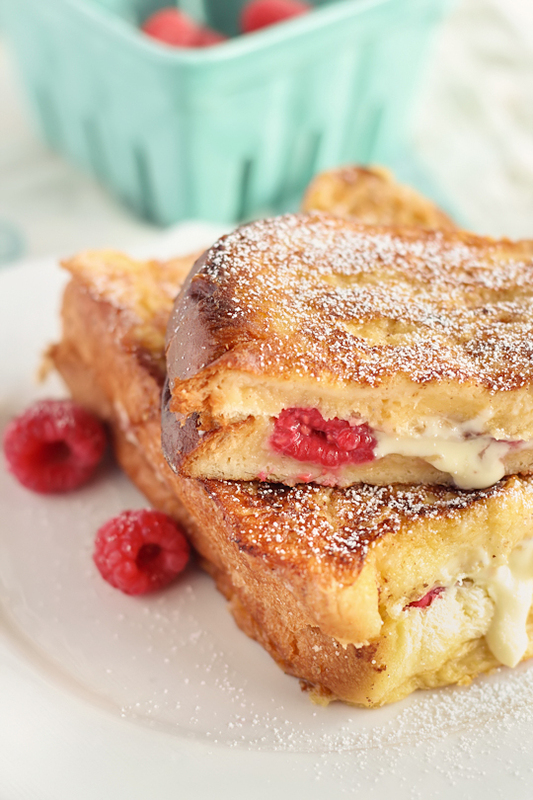 While frying, spread a layer of melted white chocolate on the top side of the bread and place a small handful of raspberries over the top. Dip another slice of bread in mixture and allow to soak for 20 seconds again. Sandwich this slice over the raspberries, dipped side facing up and press down to seal sandwich together slightly. Carefully flip over and fry the other side of the sandwich for the same amount of time, until golden brown. Repeat with remaining slices of bread, adding another tbsp of butter to the pan for each sandwich. Serve immediately, dusted with a light coat of icing (confectioner's) sugar. You can add maple syrup if you really want to, but it probably doesn't need it. Gorgeous! Perfect pick me up for a monday morning. Or perfect reason to stay home in bed? That puts the French Toast I make to utter shame! It looks awesome. This is the perfect french toast!!!! This looks absolutely divine! My mouth is watering. I'd love someone to serve this to me as breakfast in bed! This looks amazing! I am going to give your recipe a go next Saturday! Thank you for sharing! This looks gorgoeus and prbably teastes beyond gorgeous. Yum! 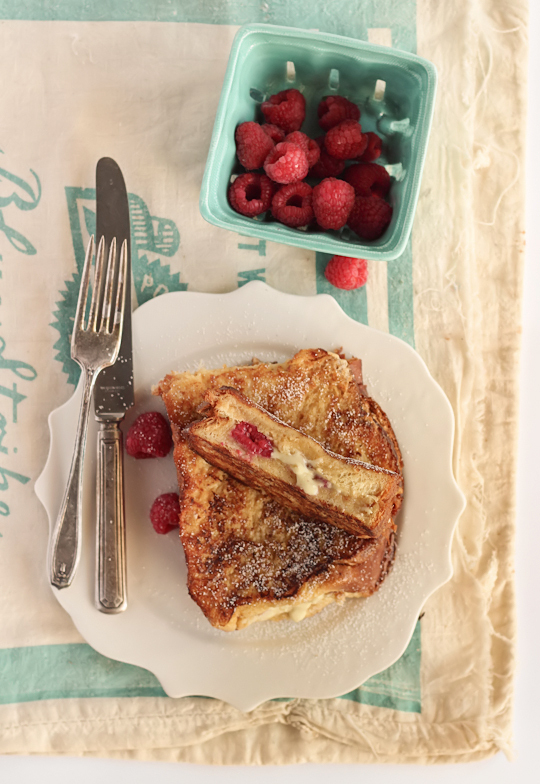 A most elegant version of French toast. oh lordy, why do you do these things to me? this looks amazing, and i know what you mean about the raspberries! i may or may not have a sneaky, overly expensive punnet waiting in my fridge, and i'm pretty damn sure this is what they are about to become! That looks beautiful, and very decadent! :) I love the combo of white chocolates and raspberries. This really does sound good -- and raspberries should be in season here soon in California. This looks delicious and your photos are absolutely gorgeous! This is stunning! I love everything about it! Yum! Ooooh what an indulgent breakfast. I love the combination of white chocolate and raspberry. It works soooo well together. I love the look of the white chocolate almost spilling out of the brioche.. looks amazing! These look amazing! Not too much like grilled cheese, in my opinion. 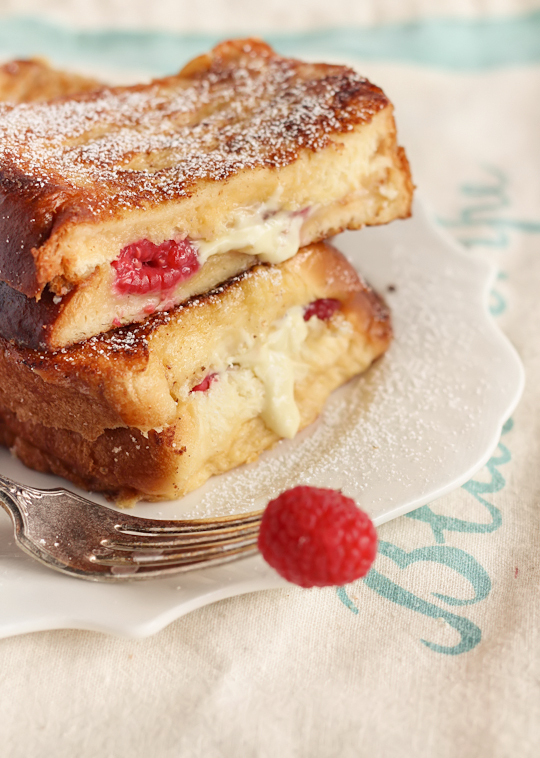 French toast has been my comfort food since I was a kid, and adding raspberries in? I'm totally going to make this next weekend. Thanks for sharing! I'm going to feature the yummy image above in my foodporn roundup list. Hope you don't mind. I'll link back here of course. This looks delicious! I've been trying to think up a yummy breakfast to have while watching the Olympics opening ceremony this weekend - thanks to you, I have found it! This looks mouthwatering! I've been quite sick of plain old french toasts recently so I'm sure the white choc and raspberries will step it up 100 notches! Can't wait to try it out! Also drooling in Prague! I have no idea where to get Brioche but there is a bread called Vanocka here that is similar to challah which might work well. I want to try the recipe this weekend and I have an entire bag of white chocolate chips that I was looking for an excuse to use. Hi Steph, where did you find that butter? I saw it in a magazine not long ago and haven't been able to locate it!! Thanks! Thank You so much! Must have a look next time I'm there!! I want to reach through my screen and wipe up the dripping chocolate with my finger. So good! French toast is the best! And this recipe sounds great. Another variation: I tried some with my homemade mandarin marmalade AND chocolate and it's fantastic. The french toast looks wonderful. 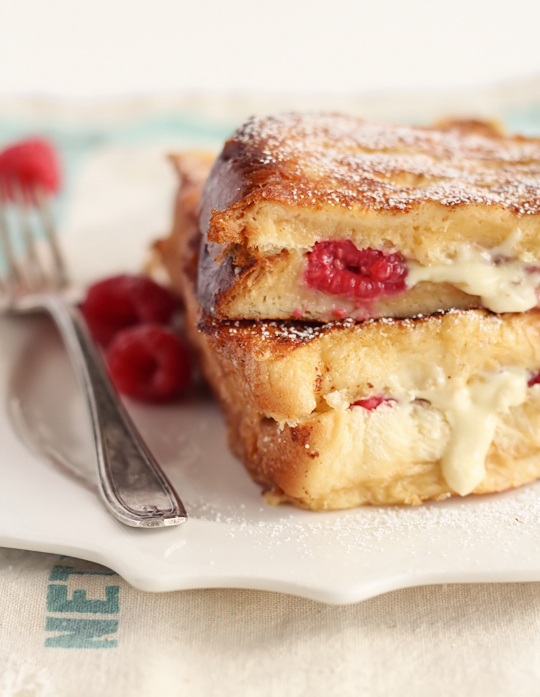 This french toast looks so sinful and indulgent... Raspberries and white chocolate on french toast? What could get better than thiss?? :D Great job! I think I may actually have gone to heaven. This sounds like the perfect recipe, I've never thought about putting chocolate in French toast before! The juicy raspberries would be perfect with it.